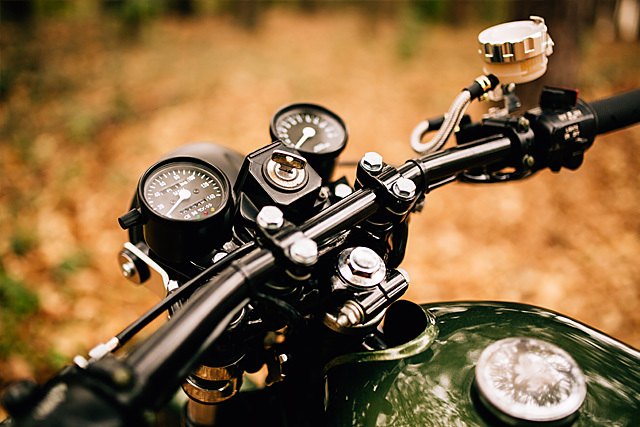 The Father and Son relationship may just be the biggest reason many young men find their way into the world of motorcycling. 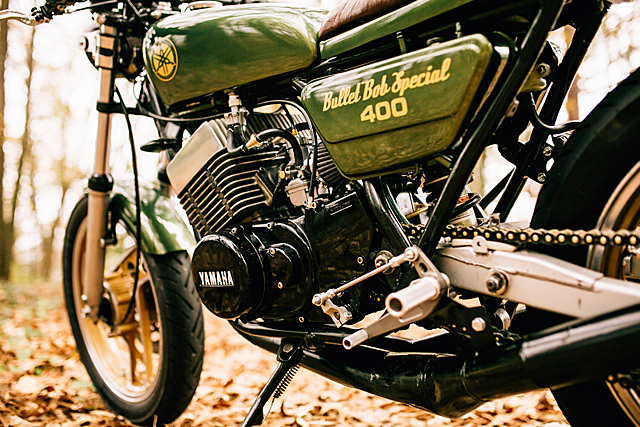 For Jared Morris and his Dad Bob that relationship extended even further and they shared this Yamaha RD400 not just as a bike to ride but as a bike they would slowly build together. 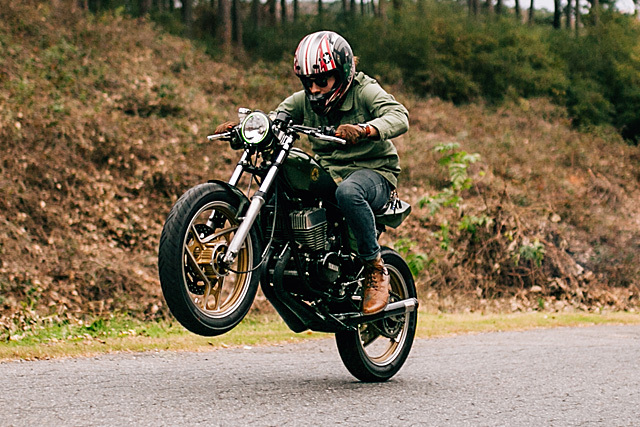 The RD could be heard screaming through the neighbourhood as Jared tested out the latest changes and modifications they’d made before ripping it back apart and making it that little bit better. When Bob fell ill Jared continued the build but with the pressures of life there just wasn’t the time to give the RD the attention it deserved. When Bob, a former Flat Track Racer, sadly passed away, Jared thought of the best way he knew to honour his Dad. 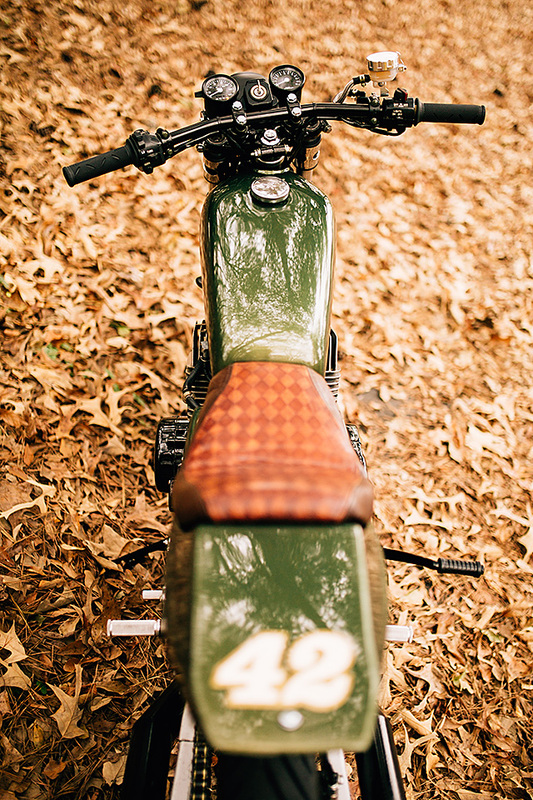 He contacted his friends at Atlanta Motorcycle Works who had been assisting with parts and advice on the build over the years and asked them to build the RD into a Tracker that would do his dear Dad proud. To get things going in the right direction the rear subframe was modified by AMW so that it would accept the Tracker seat they had in mind. 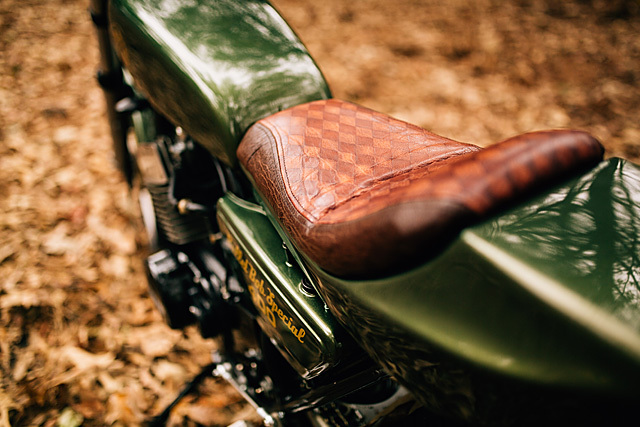 The seat pan itself is a fibreglass unit with a diamond stitched old school leather seat giving both comfort and a look of style to the racing inspired machine. The long front chrome fender that comes standard on an RD just was never going to work so it’s been replaced by a bobbed XS750 unit. With that the tins could be sent out for paint in the style Bob had once envisioned and the result is breathtaking. The gold tinged green is finished with Yamaha logos, Bullet Bob (Bob’s Nickname) graphics and the tail section wears Bob’s old race number, 42. 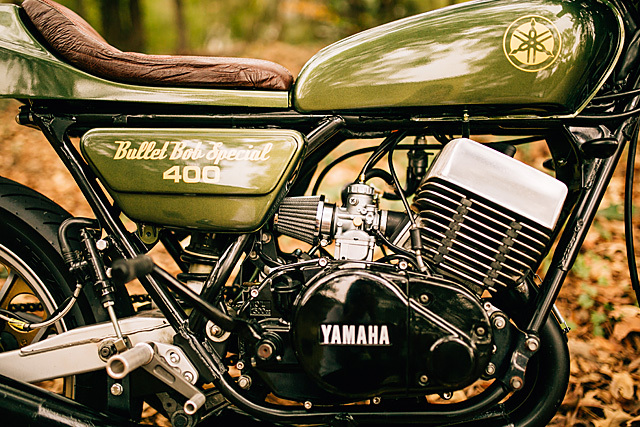 Of course powering “Bullet Bob” is the famous and beloved 398cc aircooled 2-stroke that is as loved today as it was when it was released. Forget looking at a spec sheet and examining horsepower figures, capacity and torque curves; it completely misses the point. You judge an engine like this by what happens when you twist the throttle and the reed-valve equipped parallel twin is a monster that is both violent and thrill inducing with just the smallest twist of the throttle. The motor itself has been vapour honed to clean it up and bring the metal back to its original condition before the cases were powder coated in black. The scream of the wild RD is even more impressive now thanks to a full DG performance exhaust that’s all business in black. 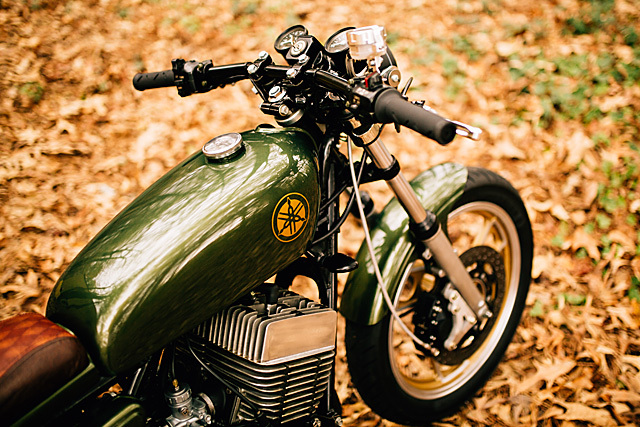 An exhaust system on a small capacity 2-stroke is the motorcycle equivalent of building an exhaust system for a rotary powered car. Get it right and the increased horsepower gains are far beyond what you would achieve on a similar capacity 4-stroke, get it wrong and torque especially can be lost at an alarming rate. A hand-built system can look great, but with forty years of experience the DG system is the perfect match for the RD. While the carbs remain standard they too have been given the vapour honing process, which is capable of cleaning tiny spaces in a superior manner to most other blasting processes. The carbs were then treated to a pair of pod filters before the boys rejetted them to suit the modifications they’d made and make the most of the RD’s extraordinary ability to pull like a freight train even with less than 400cc’s on-board. 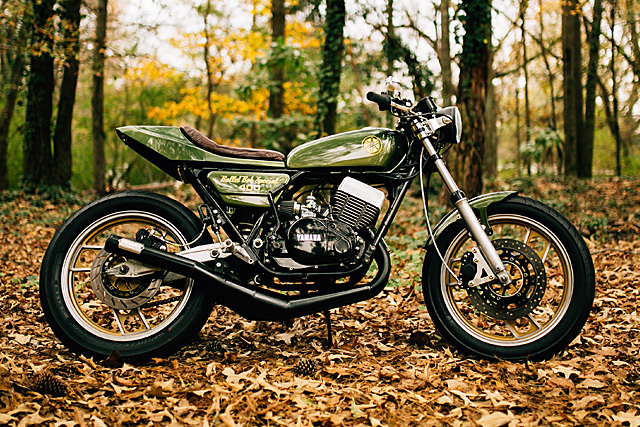 To give the bike the ability to turn and stop in a way that matches its power output Atlanta Motorcycle Works used their extensive knowledge of bikes from the period to combine the best of the factory parts that were available. The front forks are now RD400 Daytona items that were the pinnacle of Yamaha’s development of the small RD. Featuring teflon bushings that reduce stiction, the RD’s ability to change direction like a Cheetah is even further enhanced. Taking advantage of Yamaha’s extensive development on the race track that brought great success the twin shock rear has been changed to a mono-shock setup. This has been achieved with the use of the rear setup, including shock and swingarm, from the later model RZ350. With this change it made sense to use the RZ wheels as well on both front and back that with their distinct 1980s styling make a bold statement over the wire wheels so often seen on RD builds. 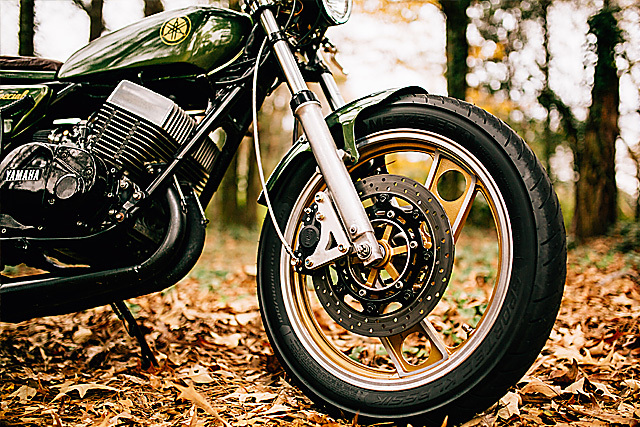 Tyre choice was just as wise with the new rims wrapped in Metzeler’s Sportec Klassik, a 21st century tyre designed to fit and suit a wide variety of classic motorcycles. It’s another nod from the big corporations that the custom scene is here in a big way and we won’t accept second-rate products and neither would AMW for “Bullet Bob”. If the snappy RD throttle delivered a thrill for its rider the same snappy action of the front brake lever could be downright terrifying. So with the RZ wheels already in place the guys made a custom bracket to mount the far superior RZ Brembo brake componentry to the older RD. The addition of braided lines only serves to increase the performance of the new brakes while maintaining a more consistent feel through the lever. Those levers are part of a new array of controls that bring the smaller components of the build up to modern-day specs. The levers themselves are metal-finished, adjustable shorties that work with a new master cylinder and clutch cable. The flat black bars are the perfect look for the Tracker styling and with new grips and switchblocks provide the function to match their form. The bulky instrument cluster now spends its days looking at the inside of the workshop dustbin and two new black gauges, with mini idiot lights, provide all the information you need and nothing more. 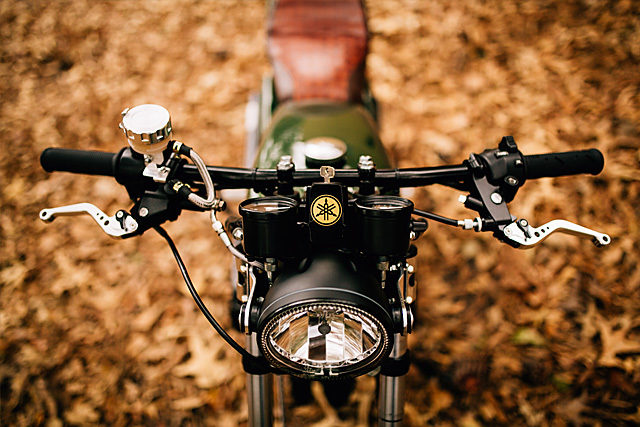 Rearsets are all business and were sourced from Blast From The Past, while the halo ringed headlight is one of the few modern touches to this classic build. When it was finally time for Atlanta Motorcycle Works to present Jared and his family the finished product they couldn’t have been happier. It’s a fitting tribute to a man who not only built and raced bikes but instilled in his son the same loves that they were able to share together. With Bob’s passing you could understand Jared packing the bike away and letting it be, but what he has done with his friends from AMW further proves that building and riding motorbikes is not a hobby, it’s what we do, it’s how we live our life. Vale Bullet Bob!